Austrian transport company A. Kothmaier has taken delivery of a range of CombiMAX vehicles, aiming to boost the flexibility of its fleet. The equipment delivered comprised two goosenecks, 2+3+3+4-axle bogies, one Joker-axle, one add-on beam, one excavator bed and one six-axle loading platform with PA-X pendle axle technology and excavator trough. Thanks to the two goosenecks, the combinations can always be used in tandem. “The combination option with the 6-axle PA-X bogie is of great interest to us,” said CEO Alexander Kothmaier, when discussing its special features. 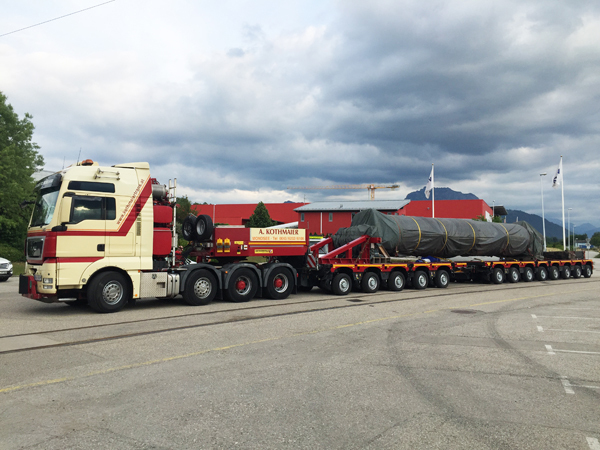 As one of the very first customers, the Austrians ordered a low pendle-axle PA-X trailer, with 790mm loading height, 60° steering angle and 600 mmstroke. Faymonville said the PA-X loading surface is equipped with the biggest excavator trough available on the market: 4,240mm long and 440mm deep with a breadth of 900mm. The trailer can be customised to suit the job at hand. “Not one kilogramme too much is added,” said Faymonville.